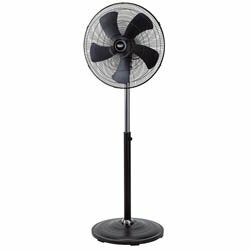 Expert Quality, 3-speed floor standing fan. The 90° tilting 5-blade composite oscillating head, circulates the air by means of the high air flow design, providing effective cooling for the required area. Fitted with an 1300-1650mm adjustable height stand. The Draper Expert range is Draper's benchmark for quality. Manufactured for the professional or for industrial use and comes with Draper's guarantee.